Eventually, I will remember to take pictures past breakfast, but so far this week, I’m not sure it’s happened. Sorry! My cold is now very much in my head, as in stuffy head, sneezing, etc. I wish I had fought it harder a few days ago, but here we are, drinking tea 24/7 and hoping for the best. In other news, we’re doing okay with the PC. I need to do a big pantry inventory and start thawing some proteins. No one is complaining, so we’re good. We’re definitely in need of more baking though. I’m trying to watch my calorie intake, so it will be an act of love to go bake for my people, but I shall do it. Hard to keep myself to just one slice of homemade bread! I resisted baking cinnamon rolls the other day . They are too hard for me to not eat but gluten gives me headaches . today we ate most of the citrus fruit, sesame turkey I made yesterday , peanut butter and honey oatmeal bars. I ate creamy chicken enchiladas from your NYM cookbook . I had them in the freezer from late August . Finished the salsa verde. Supper was mostly popcorn we pop in olive oil. We have lots of popcorn and lots of olive oil from an Aldi clearance (the oil, not popcorn ). Tomorrow we get produce at Aldi. Looking forward to it. As someone who had food poisoning a couple of years ago and couldn’t even stand up for 12 hrs , I wouldn’t touch anything that might have e coli. I also have had a bout of food poisoning and agree it is not something I would risk again. Since I don’t eat salad often and have to be careful about eating lettuce due to tummy troubles, that won’t be as hard for me as for some. I will note that if people have lettuce on hand, cooking it is an option as I mentioned with boring detail in yesterday’s post. Julies, with all this cold weather we’ve had and extra time on my hands since work has been canceled, I’d thought about baking cookies. I’d wanted to make some for neighbors before Christmas, but ran out of time. However, I have NO will power so figured we’d be better off without them so like you-resisted baking them! I have been so sick, thus, I didn’t even open my computer yesterday, but I saw your comment about the NYM cookbook and that just made my day! I’m a very small fish in a big big pond when it comes to cookbooks and food blogging. Thanks for that encouragement! Your day sounds delicious! I had the head cold the week before Christmas and I can attest to how it makes you feel like a bobble head! I couldn’t stand up too fast or I was swimmy! Bless your heart, I sure hope you get thru this soon! Since daughter loves tacos, I try to make them when she visits. Dad picked up taco shells and tomatoes yesterday while in town. Today dad & daughter went to visit a military base nearby and came back with a few things: bread, ham, cheese, oranges, rice, chicken bouillon and lime juice. The bread, ham and oranges weren’t on my list – stuff dad wanted. I’ve only spent about $10 so far this month. Our lives will get back to normal next week as hubs will be back into his usual work travel routine. I’m hoping that gets our eating routine back to a healthier level as well. A couple more days of cold weather and we should be back to average temps too – omg, can’t wait! Also finally got all the Christmas stuff back in the attic – in such a small house it looks like an explosion with it all over the place while repacking. I can’t even imagine how cold it is up in NH. We awoke to 15 & heavy frost this morning. May not seem like much to some but for us here, it’s miserable. We have a possibility for sleet and ice overnight tonight. Ugh. We warm up later this week, thank goodness. And yes, the Christmas repacking always gets worse before it gets better and I have to force myself to push thru it. I find it overwhelming. Thanks for your well wishes. Sunday was my worst day yet. Hoping that was rock bottom. B – fruit and yogurt for hubby + the last piece of French bread. Sausage and egg on an English muffin for me. S – an assortment of appetizers – from the freezer. L- We were out today at a robotics club meeting so random stuff – a slice of pizza for me, fruit, muffins, cheese sticks and beef jerky sticks for all. Yay to cranberry pork. Lately, it just makes my day to hear people using one of my recipes. Thank you for trusting me with your meal times! B – It’s the weekend, so we had ‘Lazy’ Oats, over easy eggs and hot tea; and hubby had toast as well. D. Meatloaf, roasted potatoes, broccoli. We usually tend to eat breakfast later on weekends and then just have one more big meal. Lazy oats is my name for a different cooking method I like. For the 2 of us, I boil one and a half cups of water with a pinch of salt. Then I add a cup of old fashioned oats, give it a quick stir, put the lid on and turn off the burner. It sits for 10 minutes while I sit and enjoy my tea. Then I fix eggs, toast or whatever else is on the menu, dish up the oats and we eat. 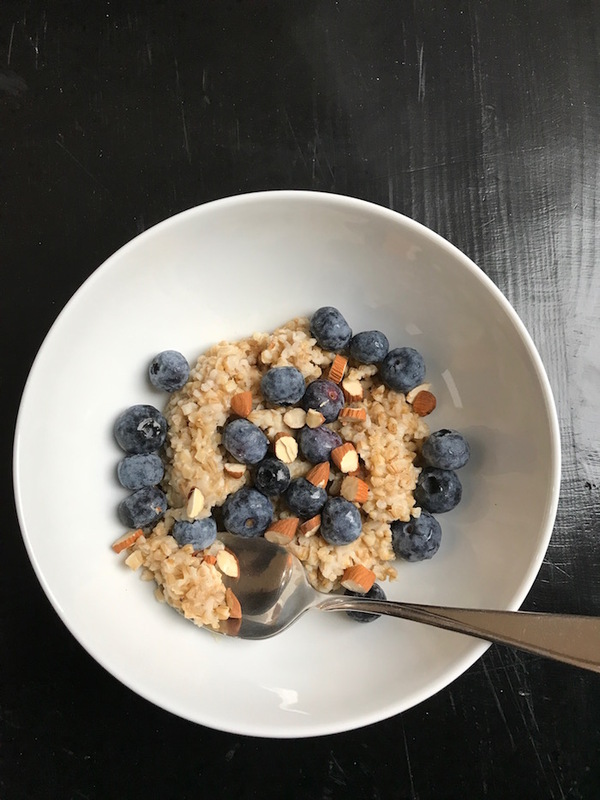 The texture is completely different from regular oatmeal and you will note that the proportion of water and oats is different also but we really like it this way and I like not standing and stirring. LOL. I have also fixed other flaked grains using this method successfully. Alice, that’s how I cook pasta but never thought about this method for oatmeal! I’m going to try it with those proportions. Thanks. Jessica, they look delicious prepared this way. I”m okay with the more traditional method but like to experiment. I think my husband might like this option better. Thanks for including the link. Feel better soon. I’m sure my kids will never be able to eat their spouses’ oatmeal because I make it so differently than the norm. Forgot to note the $7.44 I spent on 1/2 for fresh veggies. So far that’s it for the month. Still frigid here in NC and our 4-5 inches of snow have gone nowhere. Those of you in the grip of these sub freezing temps, be warm and safe! Not sure if this is the flu, but hoping yesterday’s worst day yet was the bottom. Thanks for your well wishes. Forgot to mention I made run to the store Friday and picked up dairy and bread. the bill was high due to paper goods and vitamins. I made another run today to restock some tea bags and buy some ground beef on sale to make the meatloaf. Ground meat is the one thing we are low on in the freezer, but this was a different store and didn’t want to stock up without trying it first. We live and learn, at least sometimes. It was fine and I will probably go back and stock up some for later, but now we are back to using up the meat that has been in there longest. Some of it is big roasts that will go back in reworked for meals later using cooked meat. It is hard to find really good prices on ground beef with the fat content I want. Do you have a zaycon fresh delivery drop near you ? They have great 93% beef with no pink slime, and at a good price. Second the Zaycon. We just got the 80/20 in the 1lb packages, before that they came in 10lb chubs that had to be repackaged with my food saver. I used the 93/7 when I pressure canned seasoned and meat sauce. Good stuff! L- son took a turkey/cheddar on ww sandwich, grapes, pistachios/almonds, and clif bar; hubs apparently only ate some chocolate left in the office from the holidays; I had a tuna sandwich and a found half-single serve bag of salt & vinegar chips my daughter never finished. D- We had a crazy melange of Venezuelan, Southern, and Italian. A dear friend from venezuela gave us her famous christmas Hallacas, which are venezuela’s version of tamales. 3rd year now(they’re military and won’t be here forever) and it’s a great treat for me, since i lived there as a kid. We had those along with the leftovers from the bbq place- mac & cheese for all, and the son finished off his sister’s fries and his own ribs. And then I roasted up the pathetic soft 5 mixed color bell peppers, cremini mushrooms that were somehow still alive, the overripe grape tomatoes, and red onion, all tossed in rosemary and basil olive oil with dried italian herbs, salt, and a little garlic powder. We ate about a 3rd of the veggies and will use the rest in a pasta dish this week sometime. Cleared out and didn’t waste all those veggies, so very happy about that. Today, 1/6, is my birthday, so no cooking for me!! I started the day at Starbucks with a friend in from out of town, the guys slept, I think. I had a passion tea and a little breakfast sandwich. The company was the best part! Then ran to buy a baby gift. went home and opened gifts and I received what I was hoping for: an Instant Pot!! anyone have any pointers, I’d love it! Super excited to start using it! Then we headed to an afternoon couples baby shower where we ate some goodies. I consider the cupcake i had there my birthday cake. We raced home to pick up our son and went to see a movie at 6pm; The Post. It opens everywhere this coming weekend, but we have it early since we live by DC. It was EXACTLY what I wanted to watch and we thoroughly enjoyed it. Then we went to a favorite restaurant right by it for a late dinner where I wanted all their appetizers- they have the best deviled eggs ad crab and shrimp fritters with an amazing sauce & corn salsa. So we had those and I also had a small salad. So happy, so satisfied. I also found a recipe for pear bread, which is great because I have some mushy pears and now I won’t waste them. I’ll bake them tomorrow or monday. Tomorrow we have lunch plans with friends after a baby church blessing. Looking forward to it. Hope everyone is doing well! We are still bitter cold, but I did NOT let that stop me today. And it was great, even if I almost had to use my inhaler it was so cold (negative wind chills are insane. This San Diego girl does not like cold at all- why do I live here again?). Happy Birthday Heather! Glad you had such a nice day!! Happy Birthday! Sounds like a great YOU day! Thanks for the cheering on and ideas! I’m so excited. I have old eggs that need boiling so I think I’ll try those first! I was just going to hard-boil on the stove, as usual tomorrow, but I think I’ll unpack the pot first! Yes to the boiled eggs. Only I don’t let them rest 5 minutes. I release immediately. Depends on how you like them. Happy birthday Heather! Sounds like you had a fun filled day. Stay warm! Happy Birthday, Heather! Glad you could do all those great things! You probably already know, but don’t forget to breathe through your nose in cold weather, preferably also through a scarf. I have the same problem since I’m asthmatic. But, if I’m careful, take my meds and do some breathing exercises it stays under control and I don’t need that inhaler that is always with me anyway. And we are the same age by the way, I’ve just got 5 months on ya! Due to the unrest in Venezuela, many families couldn’t enjoy Hallacas this year, sad the state of that country right now. I sure wasn’t in the mood to cook today after being totally spoiled during our mini vacay. L – hubs had a nut pack (Trader Joe’s almonds, cashews and dried cranberries), I used the last boiled egg and had a half of a deviled egg sandwich and tortilla chips. D – In the morning I put a rump roast from the freezer in the crockpot with some salsa from the fridge, shredded it up and we made tacos. Both flu strains A and B seem to be rampant in CA. It’s been all over the news here how impacted the urgent cares and emergency rooms have been. I’m afraid to go to crowded places cause I don’t want to get sick. I watch my 3 yo grandson two days a week so I need all of the energy I can muster. Breakfast: lo roast chicken, a few nuts and pretzels, English muffin for me. That’s probably the strangest breakfast yet! Hubs had egg, ham and cheese tortillas. We ran to the store today. They had bread for $2/loaf, which where I live in BC, Canada, is about as cheap as “good” bread gets. We also got lettuce, plain saltine crackers (hubs CANNOT eat soup without his crackers…) and some Pepsi, also for the Hubs as the man bleeds the stuff and we were totally out. Spent $30 so far this month. lunch-chicken noodle soup with frozen broth, frozen chicken, a freezer soup pack of chopped celery/carrots. Easy to make and tasted good. Added Siracha for a kick. dinner-more soup. Husband is ill so wasn’t hungry. Easy for me to have soup twice. I have almost quit baking since our daughter was diagnosed with a gluten allergy. I have found only a couple of recipes that are worth making. Most of the gluten free recipe sites/books/blogs seem to assume if you do not eat gluten you are also vegan. Consequently, the recipes call for all kinds of ingredients we do not normally eat, making experimentation VERY expensive. The best recipe we have found to date was for chocolate chip cookies on the back of the Bob’s Red Mill gluten free one-to-one flour. Allergies are challenging and can be very frustrating! Have you tried any completely flourless cookie recipes? I saw one in a Farmers almanac cookbook that only had almond butter, a bit of sugar, an egg, some vanilla and cinnamon, chopped dark chocolate, oats, dried cherries and coconut flakes. Perhaps worth trying?!? They’re called (not surprisingly) gluten free chocolate coconut cranberry cookies – probably could search it for the exact recipe. Laurie – these make for some soft oatmeal cookies but I thought I’d share with you…. Mix together, bake 350 for 15 – 20 minutes. Thank you for the suggestion. I made a batch today and everyone enjoyed them. My husband told me the recipe was a “keeper” which is his highest praise for food. The recipe said it makes 12 to 18 cookies. I must have made my smaller, because I got 2 dozen nice size cookies from the recipe. Here is the link https://www.almanac.com/recipe/gluten-free-chocolate-coconut-cranberry-cookies-recipe. Try lynnskitchenadventures.com. She has simple gluten free recipes and bakes a lot. Oh the fun of the diet kitchen! Mine is currently not bad, but I have been there with several variations through the years. Try cooking a fat free, very low salt, and low sugar Thanksgiving dinner. I was cooking at my folks for multiple people with health problems. I think I’m the only person who ever went to their parents for T day weekend and lost 5 pounds but I did it. Of course I was also caring for my Dad in a wheelchair which added to the exercise factor. Good luck with your diet kitchen journey. I always lose weight at my parents for Christmas because they serve a lot of foods I can’t eat (cheese and gluten and nuts give me headaches ). They always have something I can eat, but it’s about 1/3 of the food. Not complaining but it’s just how it is . Yesterday, 1/6 went quite well for us as well! My daughter and I headed out early for karate classes so she brought some ham and cheese, a banana and some juice and I had coffee. Little Guy had the last frozen homemade pancake and hubs had coffee. I made blueberry muffins when I got home and they each had one. Lunch was leftover pizza for some and cheesy cauliflower with hot dogs for others. Apples, pears, and cheese for snacks. And more coffee and tea for me! Dinner was a mix of soups. I pulled two jars of minestrone, two jars of broth, and two containers of broccoli that I had steamed too long back in September and had marked ‘for soup’ from the freezer. So I added the last of the LO tomato soup to the minestrone with some pearl couscous and broth and hubs and Little Guy were very pleased, while daughter and I had broccoli cheese soup with the last of the Boursin herb cheese. I baked a few squash corn muffins to go with it. Cleared up some space in the chest freezer! Then I snacked on tortilla chips near bed time…ugh. Sounds like a great soup! With this meal, I used the last two sliced of chicken parmesan that I made a few weeks back and froze; so today, I took the last package of chicken cutlets from the freezer and cooked a small pot of marinara and make six more slices for the freezer. It was a good way to use up the mozzarella from the fridge that would have gone bad soon anyway. I also took a package of chicken sausage and the last two packages of ground beef from the freezer and made a big pot of sauce with meatballs and sausage that I will divide up and freeze for future meals and we will also have some on Sunday with the leftover pasta. I don’t feel like cooking on Sunday so this works well. Lunch at home before we ran a few errands… -Kids had leftover Homemade pizza or sandwiches and fruit.. Hubby and I had turkey sandwiches and pretzels. Dinner- we picked up some ready made soups at Sams- they had instant coupon and fed my desire to NOT think for supper… So choice of Tomato Bisque or Broccoli Cheddar. I did make a pile of grilled cheese to use up bread and a roll of pillsbury bisquets served with honey for dessert. Kids found random ice cream bars in the deep freeze later when they wanted ice cream. Hubby feeling a bit better this am. Hoping he continues to feel better all day. Only 1 short nap so far today…lol…hopefully he will be feeling better in the next couple days! Oh, I’m sorry Mona. I guess it just has to go it’s course. Unfortunately, the flu or even a cold has a way of hanging on until it just lets go. The only thing he can really do is rest as much as possible and drink a lot of hot liquid and if the doctor gives him something to move it along, all the better. Something we do if we are congested is, I heat a large pot of water. Then I put it on a towel on my kitchen table and put my face over it with a towel over my head. It’s as good as steam from the shower but more comfortable because you can sit down. And if he has a fever, he doesn’t have to get out of the shower into the cold air; because as you know when you have a fever, it always feels cold. It will open up his sinuses and he will be able to breathe better. Then a nice cup of hot tea afterward, a blanket and the TV. I hope he feels better real soon. Still not doing well Stephanie. Planning on going to the Dr tomorrow. Guess he doesn’t want to cough all over the Attorney at the closing on his Mom’s house on Wednesday. Question….was the Pantry Challenge for today posted? I didn’t receive it. Dinner was ham and cheese wrapped in a tortilla. I bought taco shells and seasoning yesterday. I see that hubby has thawed out some hamburger so we will have tacos today. The chickens got the stale bread and leftover stuffing. I don’t see that as food waste. We feel the same way about the scraps we give to our chickens, especially since they give us eggs in return. Dinner – will be deli turkey meat and cheese panini because I have shredded lettuce that is wilting and needs to be used. It’s 50 cents worth of lettuce shreds but just can’t bear to toss it out. Rearranged my weekly meal plan on wilting lettuce. I’ll make some soup to go with the sandwich too! Happy to report that I only spent $17.87 this past week. Not exactly a “no-spend” week but some essentials that we needed. I budgetted no more than $20 and came in under budget. YAY!!!!! Been trying to stick to the challenge – but Friday night my daughter called as they were picking up Chinese takeout and wanted to know if I wanted any – so Friday night and Saturday lunch I ate Chinese. Saturday (6th) I had: B – English muffin with peanut butter and tea / L: Chinese takeout / D: Baked two large pork chops covered with Stovetop Pork stuffing mix with beets. Then Sunday had tea with my last cinn-raisin English muffin with tea / L: Can of light split pea soup D: will eat remainder pork chop with remainder beets… Tomorrow I’ll set my slow cooker going with chicken breast slices, carrots, chicken broth, celery and tomorrow will add home made matzo balls and a 1/4 bag of fine egg noodles – nice way to make the house smell well while waiting for supper. Liking this challenge. Promise not to buy anything I don’t absolutely need. ALTHOUGH – I want some cashews, almonds, vanilla granola, fresh spinach, eggplant and broccoli – I don’t NEED these items but I crave them – the only thing I need is milk and eggs. L- I had crackers and cheese for lunch and Hubs had another bowl of homemade chicken soup. It’s good soup but as I’ve said before, I would be so bored to eat the same thing day after day. Saturday breakfast: Banana bread (officially tired of banana bread for a minute! But officially used up all the brown bananas. LOL. NYM Lemon and flax waffles. ALMOST got in over my head with ingredient subs but the final product tasted good. Made enough to use up all the greek yogurt, so that will be our breakfast over the next few days. We are out of syrup but I’m considering doing the book’s suggestion of berries and whipped cream. Hubby uses whipping cream for his bulletproof coffee, and we have a couple of opened bottles that I feel like need to be used up if they expire soon. Otherwise I’ll need to get creative with a topping if I don’t want to go to the store. Dinner: veggie soup at my mom’s house. Yum! This upcoming week is planned for but may get tricky as we have two different sets of families coming in at two different times. I think we have enough to feed everyone, though. I’ve been spending about 45 minutes each day doing SOMETHING to keep me ahead, and I’d like to keep that trend going. We set our grocery budget biweekly, and we have a good amount left for the upcoming second week, and I have a full fridge. My goal is to save/roll $100 into next week’s budget. We shall see.. If you have berries, make a berry syrup. Pioneer woman has a recipe – just saw it on one her shows. I think she’s done 2 , blueberry and blackberry. You coukd also take some strawberry jam and thin it a little with orange juice! Again, the reference to NYM made me smile. Thanks! One of my sillier 2018 goals is to use only recipes from cookbooks I own, vs Pinterest or blogs. NYM and GCE will be getting a lot of turns at my house! Very cool! There are so many recipes in there (the majority!) that have never been blogged. I think you’ll have some fun. January 7- Finally made it out of the neighborhood today to go get some items at the store. But still don’t think kids will go to school tomorrow. Was -3 this morning. Where I am in VA hasn’t been that cold in 18 years. B-. Cinnamon oatmeal for hubby and I. Boys slept late didn’t eat breakfast. Snacks- Salsa and chips for 3 of us. S-. Went out for dinner for #2son birthday. Everyone too full for Dairy Queen ice cream cake. Did have to go to Menard’s today for some paint. They had Jacks frozen pizza on sale $1.99 each. Oldest son was along and he picked out 6 of them. Total $11.94 that was the first I spent on food in the new year. He will probably eat one everyday at lunch this week. Finals week, so schedules will be different for both boys. Put a turkey carcass, celery and carrots in the crockpot at 10pm Saturday night to make broth. Going to have turkey noodle soup on Sunday for supper. Love reading what everyone is reading. I love the pantry challenge. I did not have enough to not shop, so I did shop yesterday. However I got a lot of stuff at Big Y with their buy 1 get 2 sales. My goals for the months is to cook and eat at home with minimal/no eating out. Good luck to all. So now that I read this, I see that we had bread of some sort at every single meal. Not so great for my waistline. At least it was all homemade. Next week the guys are back to school/work, so I can get back to salads for lunch. The guys will stick pack sandwiches though, so I also made another loaf of whole wheat. Fruit and veg consumption is good. Chocolates, well we just won’t talk about them. Ahem. At least my Fitbit says I walked 7.16 miles over the course of the day. Over 7 miles. That’s amazing! I did that during our England trip, but it’s so hard to pull off at home! I felt it by the end of the day. :} My average is 4 miles per day. Saturday we got two dog walks in plus I was on my feet a lot doing laundry and housecleaning. I guess all the back and forth around the house really added up. I’m going to try to increase my average to 5 miles per day in 2018. Of course between having a cold and the expected two days of rain this week I’m not off to a very good start. Maybe I need to do more laundry and clean the house more. That could be a win-win for me. I was able to clear out quite a few things today. I focused on the Christmas ham we get every year from work. Breakfast: Omelet with ham, green peppers (frozen from this year’s garden), and Havarti. Lunch: Split pea soup, using ham bone. Used up the rest of the split peas. Dinner: Ham, broccoli and cheese turnover. Used up 1/2 box of puff pastry which has been in my freezer for who knows how long! Will freeze extras. great job! yippee for using things up, but also for using the ham in every meal but so differently that I’m sure it didn’t seem like the same thing three times. Lunch: I had leftover Eggplant Parmesan. Dinner: I had an egg and cheese bagel (bagel from the freezer). Hubby was sick and tends to graze on weird things when he’s sick so ate an odd mix of tortillas, potato salad, and chips throughout the day. Dessert: Christmas candy AGAIN ! I really don’t think anybody here spends absolutely nothing during the month. Most people will need to get milk or produce at some point. I’m sure if we still had small children as you do, we would not be at this point after one week! What you do to keep every fed and happy with a vegetarian spouse is nothing short of amazing! I definitely don’t plan to spend nothing. I have little kids and I want them to keep eating produce and cheese and have milk. I also will buy eggs. This is a make your own rules challenge . I agree and with small kids at home it is a totally different ball game. I’m not sure I would have tackled something like this when our two were young. So kudos to you Julie! Well done Cindy at 0.00 spending! I’m confident the no spend ends this coming weekend, but I’m excited for our progress so far. We were finally above freezing today in Omaha,Ne.!!! Tomorrow it is supposed to be over forty–car wash here I come. Breakfast–husband had the last of the egg thing we made the other night. I skipped. Lunch–I had a bowl of the beef barley soup and a cheese stick, My husband grabbed a deli sandwich while he was out. Dinner was hamburgers, baked sweet potato fries and a cup of soup was the veggie course. I hope the people with unusually frigid weather get warmer temps soon. I made it thru a touchless car wash. My car looks great from a distance but up close is still dirty. Note to self– go to a regular car wash!! The weekend was a flurry of activity. I hope to get back to some normal meals and schedules. B: HM bread, smoothies, softboiled eggs, coffee for the adults. L: Kids had rye bread with fish and carrots on the side. DH and I skipped because af the late breakfast. Afternoon snack: Bread/crackers with carlic cream cheese. Carrots, almonds. D: Lasagna with mixed salad and HM rolls. S/dessert: Last of the brownie from NYE with the last of a carton of vanilla ice cream. I used up the last of the rasberry coulis from NYE in the smoothies and the crackers we had as a snack were expiring, so good to get those eaten up as well! We had some clementines which were starting to look a little sad (this always happens after Christmas, it seems), so I juiced them and froze the juice in an ice cube tray. Whenever we have orange juice, I put in a cube of frozen juice. It’s really good! I checked my long term storage of apples (picked in October). Some were going a bit soft, so I made another batch of apple sauce, which I will preserve and add to my storage. We can go trough a lot of apple sauce if we have it on hand, so this should disappear rather quickly. Do you ever just poach the apples in a very light syrup. That is the way my hubby likes them best. When I have a lot that won’t keep like when his Dad brought me bushels of them, I just peel and quarter or slice them and can them in a very light syrup using recommended times. My Grandson thinks they are special and I sometimes take a couple pints I have just cooked up over to him as a special treat. I’ve done pears that way too Alice, they are just so tasty and fresh tasting! I haven’t tried that, but it sounds good. We go trough a lot of apples, just eating fresh and to flavour porridge, so usually my only issue is running out too soon lol. It has been a while now that every January I make a food inventory, but it is much more fun since I’ve discovered the pantry challenge a few years ago. I thought I was a weirdo until then hahaha. So, he picked the meals while I had to write down the pages numbers and prepare a meal planning. Starting from today I’ll be joining your pantry challenge. How wonderful that they made the journey and that you can join us in the pantry challenge. My excuse for all the shelves of cookbooks is that I read them at different times and they inspire me even when I’m not following the recipes. I do keep and refer to lots of them, but some I must admit are just for fun. I am slowly weeding out some of them, as I do have lots that don’t get much use. Every cookbook I own has been read at least once and probably more just like any other book – from cover to cover! Yay! Thank you for these encouraging words! Brought a smile to my face! I love hearing what people from other countries use, so I’m happy you are joining in. That’s what food does, it unites food lovers around the world. Apple fritters, ham, eggs and hash browns for breakfast. As long as the deep fryer was out I decided to make homemade onion rings and used the last of the batter to throw in a few chicken strips. Dinner time I wasn’t hungry. Hubby fried up some hamburger from the freezer to make tacos. Lots of leftovers. Any suggestions for using up Strawberry Jam? I made too much last summer. It’s a brightly colored loose pack, made with just strawberries, sugar and lemon juice using the old timer recipe with no added pectin. It’s great on ice cream, but everyone here has been on diets for months and no end in sight. ps – I love the new meal plan I just purchased. Your recipes are so interesting and well thought-out, nothing like what all the other bloggers offer on weekly meal plans. Mixed into yogurt, oatmeal, strawberry bread, mix in muffins. There’s a recipe out there to make your own nutrigrain type bars filled with jam. I’ve never done it but I know a friend used to add just a spoonful of jelly or jam to things like stir fries for added flavor. I suspect that any recipe such as barbecue sauce or sloppy joes that has you add a bit of sugar could have the jam substituted in. To test it you could put some of the sauce in a small bowl and try it there instead of the whole recipe. These are great ideas! I have some leftover blueberry jam too. I love vinaigrettes and breakfast bars would be a good way to use up our oats too. We are senior citizens and don’t like to throw out anything. My spouse is 73 with ongoing heart failure, so yogurt, breakfast bars, and salad are all good things for the diet. We can probably find a good spinach salad recipe to incorporate the jam. I absolutely love the dressing this salad: https://goodcheapeats.com/2015/04/spinach-salad-with-chicken-and-strawberries/ and it’s best made with homemade jam. So good! I’ve been taking those the last week, since before I got sick. Unfortunately, doesn’t seem to be doing anything remarkable. B – fruit and yogurt followed by freshly made muffins. Rather than adding a spoonful of jam (fruit explosion muffins) I used the last of the cranberry mandarin sauce – really nice and it used it up too! Win/win! L – a slice of toast and cream cheese, hubby skipped. S – Chinese ginger chicken with sticky rice and some mini egg rolls from the freezer. The Chinese we bought at the grocery store – we were running late and it was not expensive. We enjoy Chinese food but don’t have anything handy in town. The sticky rice was from the pantry. Cranberry mandarin sauce sounds amazing, both tart and sweet – do you have a recipe to share? Cindy, I adapted a recipe to suit what to I had on hand. I used a 12 oz bag of fresh cranberries, 1/2 cup of sugar and 2 mandarins that I peeled and ran thru my mini blender. Added 6 oz water and brought the mix to a boil, making sure the sugar was fully dissolved. (The cranberries burst as they cook). Simmer until the sauce thickens – about 15 minutes. Very simple !!! Hi Mona. No the pantry challenge, Day 7 was not posted yet. Jessica has a very bad cold too and I guess she didn’t feel up to it. Because she lives in California, though, she usually posts late at night our time so I don’t usually post my daily menu until the next morning. I’m sure when we wake up tomorrow, she will have posted Day 7. I’m sorry your hubby is still feeling so crummy. It’s so cold out; I can’t warm up; it’s one cup of tea after another all day. So I can imagine how cold and miserable he must feel. Hopefully in the next day or two, he will start feeling better again. Yes, and yes. Plus we started back to school this week, so the days are busy. Thanks for your patience with me! Found a cooked, Cajun Fried Turkey weighing a tad over 10 lbs for $10.00 at Kroger!!! I just had to buy it, break it down for the freezer and make stock with the carcass. That is like $0.99/lb and I can’t buy deli meat for that price! Today I used some chicken broth from the freezer to make Italian Wedding Soup for dinner with my Stromboli. It was awesome. Have not had it in years. Since I didn’t have escarole, I used some leftover cooked spinach from the freezer. I used two hamburgers from the freezer, defrosted them and made 41 mini-meatballs. About 20 mini-meatballs went back into the freezer. LOL! DH was so impressed, he had two bowls of soup! Dinner – Stromboli filled with ricotta, mozzarella and spinach; Italian Wedding Soup. D – grilled chicken, steamed broccoli, yellow rice – the rice was a different brand than I usually buy and I’ll not be buying it again. Back to Vigo! Of course I bought the larger bag of it since the Kid loves yellow rice so now I’ve got a bunch of rice leftover. Thankfully he’ll still eat it and maybe I’ll be lucky and the parts that didn’t get fully softened even with extra liquid and extra cooking time will somehow soften up overnight. Otherwise, maybe it’ll get thrown into a soup of some sort. Vigo is my favorite as well. I like to squeeze a little lemon juice on it, and I prepare it with olive oil too. You’re making me want some! Oatmeal bars with a jam layer! B- Cinnamon oatmeal for hubby and I. Boys slept late again. Snack – Corn dip (aka Crack). #2son makes this often to have for the week to eat with lunch and to have as a snack. Used up 3 cans of Mexican corn, 1 can green chiles, Greek yogurt cup, also has mayo, cumin, chili powder, cheddar cheese and onion. Use tortilla chips with it. S-. Crockpot turkey noodle soup with oyster crackers and beer bread. No soup left, I really wanted some for the next day. Made 2 loaves of beer bread with some older October Fest beer. There are still 6 bottles left so I’ll be making more. Also made on Saturday 4 dozen chocolate chip cookies from some cookie mixes I had. Cookies already all gone. I don’t bake much and on Sunday there were questions on why I was baking 2 days in a row. I made the first week spending about $12 , but I already have a sizeable list for this week. My pantry is under control, and my freezer is stocked for several months, but I have to watch my spending with produce. I always overbuy! Kids had chocolate chip banana bread and smoothies for breakfast. I had a smoothie. Packed lunches for school/work. Tonight included two different basketball practices and a meeting for me. Dinner was left over pizza purchased Saturday night-mostly with a gift card. We got 2 dinners for about $12-bonus. I don’t have a fully stocked freezer to do a full blown pantry challenge, but I hope to use what I have and save a few bucks this month. It was back to school today from the holidays, lets say it was an interesting transition…. Day8: B- homemade yogurt/granola, L: Pork & Coleslaw D: Mushroom chicken in the intstant pot, with rice and green beans and roasted brussel sprouts. I spent about $150 this weekend but it was a combination of household items and a small amount of grocery neccesities like milk, bread, veggies, fruit. I dont have a separate budget- I track all our family purchases under one budget, I use coupons when its on items my family needs, so this weekend we used $40 of coupons for laundry soap and toiletries.